It’s no secret that McDonald’s fast-food includes enough preservatives to survive a nuclear apocalypse. Watch five minutes of Super Size Me and you’ll especially feel inclined to never visit another drive-thru ever again (even their attempts to be “healthy” often end up a Lovecraftian nightmare). 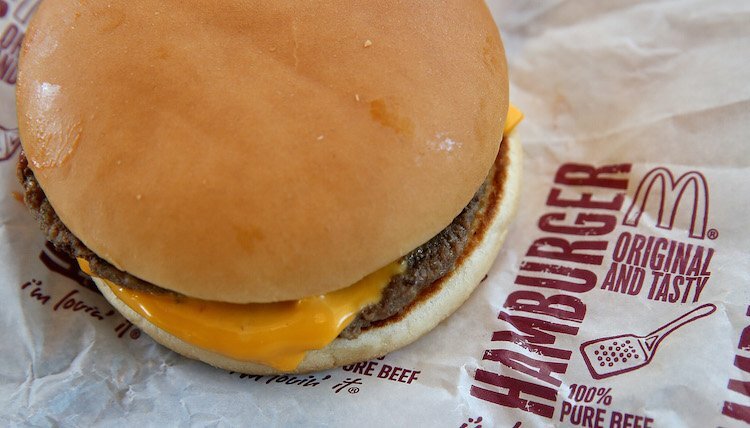 Now, a man from Ontario, Canada named Dave Alexander tested the ability — or lack there of — of a McDonald’s cheeseburger and fry to decompose, and wants to sell the results. You can see the eBay listing here, complete with a tempting turquoise bed-spread background. But be warned, you’ll lose a little faith in humanity as the current bid at the time of this post is $150. A meal allegedly bought June 7, 2012 is going for at least 10-times the original price. Which means this Mr. Alexander guy is a genius. … Alexander said he asked his daughter to buy the McDonald’s meal on June 7, 2012, as an experiment. He’d heard of fast food burgers lasting for years without rotting and wanted to find out if it was an urban legend. “We live in the country and we’ve never seen a fly land on it. Ever,” he said. So how did the Twitterverse feel about the McEternalburger? How one would expect. That is just GROSS! Shows how many chemicals are in that so called ‘food’. Alexander tested food decomposition with a similar burger and fry he prepared himself at home. The home-made food decomposed relatively quickly. So what’s up with the McDonald’s food? Why does it not appear to be real food? According to Snopes, just about any type of food, or organic matter, that dries out quickly won’t decompose quickly. So dry food = petrified waste. If there’s moisture, you’ll have your own eco-system in no-time. I am rather curious to see how a Big Mac, Whooper, Wendy’s Baconator, and an In N’ Out ‘double-double’ all do sitting next to one another for six years. Take a trip to that next drive-thru at your own risk.